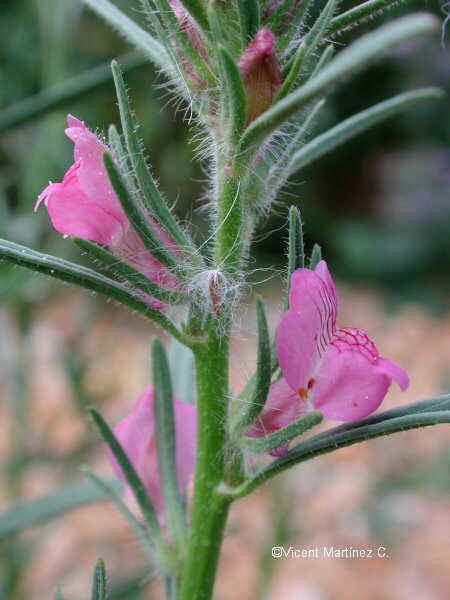 Photo of Antirrhinum orontium L.
Annual herb of the Figwort family – scrophulariaceae – up to 50 cm. Erect stems, thin and sticky, specially at the top. Leaves with a short stalk, linear lanceolate, showing a distinctive midrib. Flowers till 1,5 cm long, generally pink, in loose racemes. Calyx longer than the corolla. Fruits in capsule, very hairy. In cultivated dry lands, by the side of the roads and infertile places.